Once a small fishing village, Hurghada has grown into the most toured destination in Egypt. Though it sits beside the bright-blue waters that bring many visitors to the area, the Abdel Monaem Read Mosque stands tall on its own — offering visitors the chance to connect with the daily life and culture of the beach town. The intricate design of the mosque’s classic Islamic architecture — combined with the scenic placement in the area between the main street and the ocean — makes this a unique mosque to visit. 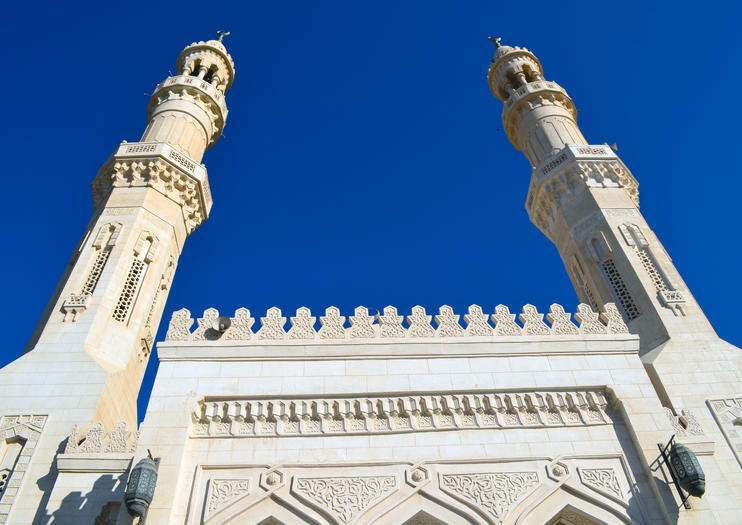 The minarets can be seen from long distances, and the call to prayer can be heard resonating from within its walls. Domes, arches and hallways are detailed with delicate carvings. Local citizens can be often seen heading to the mosque, with most visiting on Fridays for prayer. The Abdel Monaem Read Mosque (Big Mosque) is located in the center of Hurghada off of El-Nasr Road. Out of respect, women may be asked to cover their heads before entering. Visiting hours depend on local religious services. Admission is free, though donations are accepted.